Red Hill is a rural/residential area on the Mornington Peninsula, 60 km south of Melbourne. 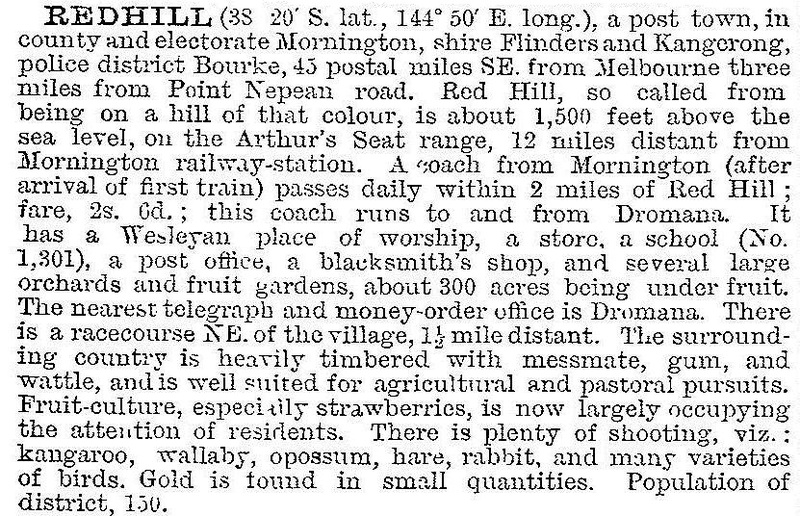 Its northern boundary adjoins Dromana, and to the south it adjoins Red Hill South which follows the central slopes of the Mornington Peninsula to Shoreham. The name is descriptive of the colour of the volcanic soil, and possibly referred to Bald Hill, now a nature reserve, north-east of the Red Hill village. Despite the obvious evidence of increased orcharding and dairying, the building of a branch line was held in abeyance until 1920. The imminent construction works, however, brought about the building of a cool store at Red Hill South, the railway terminus. The Red HIll Fruitgrowers and Producers' Association began the first of their successful annual shows in 1922. Red Hill South became the main community centre particularly with the recreation reserve (1915) which became the site of the annual show, and later, the Red Hill community market (1975). The closure of the railway in 1954 was a recognition of its being overtaken by road transport and it had little or no effect on Red Hill's steady growth. Presbyterian and Anglican churches were opened in 1934 and 1955, and Red Hill Consolidated School (1951) replaced eight village schools on the peninsula (549 pupils, 2014). The Church of Christ constructed a larger building in 1960. Red Hill includes some of the peninsula's most attractive scenery. A horse-riding trail follows the old railway line, ending at a bushland reserve. Orchard holdings have become fewer, but four vineyards have partly compensated for the loss. There are also flower and berry farms, and several cafes, restaurants and galleries are further diversions for tourists. Red Hill South has a general store, shops in the vicinity of the former railway station, a public hall and a Uniting church.